Plan to visit us during our signature event: Dogwood Days - the annual week-long celebration of estate’s iconic kousa dogwood trees this June! 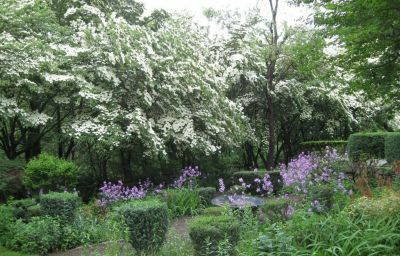 Each June, the Wakefield Estate welcomes visitors to celebrate the annual blooming of hundreds of Polly Wakefield's kousa dogwood trees. We’re excited to announce that this year’s Dogwood Days will include our sixth annual Dogwood Days Garden Party on June 16th (rsvp required), wrapping up a week-full of special events, including open hours, guided tours, a tree sale and more. This year, Dogwood Days will begin on Saturday the 9th with Garden Conservancy Open Day. Starting that day for a week, the grounds will be open daily for self-guided walks around the formal gardens where hundreds of kousa dogwoods will be at their peak bloom. A guided tour will be offered daily at 1:00 pm.